We’re eating sweet and spicy grilled chicken breast marinated in a mildly spicy soy, bourbon & brown sugar sauce and served over a bed of fluffy basmati rice with a ladle of bourbon sauce to finish off the dish. The bourbon chicken at the mall was always sweet and savory and very lightly marinated. It was indeed the initial inspiration for my bourbon chicken. Oh yeah, that and the fact that a recent house guest happened to leave half of a bottle of Evan Williams which I’m not likely to drink…ever. Anyway, in my version of bourbon chicken the meat is much more heavily marinated and the flavor of the bourbon is more pronounced yet not overwhelming. I also chose to make a sauce using part of the marinade, as both Tyler and I are big fans of rice and gravy. 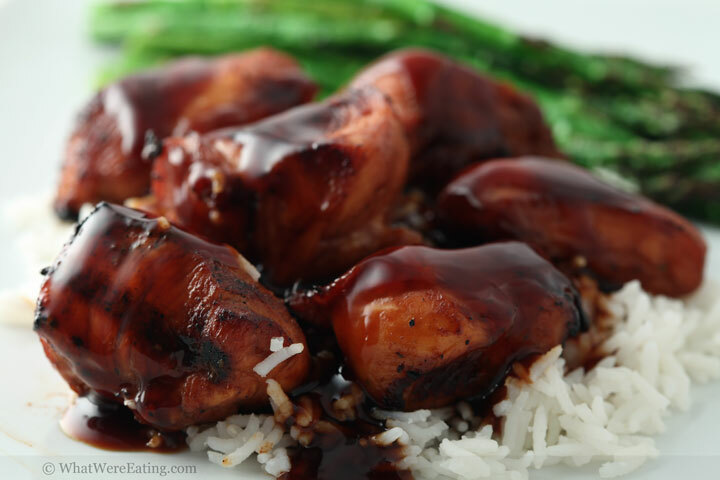 Next time you’re craving some sweet and savory bourbon chicken I hope you’ll give this recipe a try and let me know what you think! Place all ingredients for the marinade/sauce into a small sauce pan over medium heat. Bring ingredients to a simmer to dissolve the brown sugar. Stir occasionally. Remove from heat and let cool to room temperature (about 15 minutes). Reserve and refrigerate 1/2 cup of the mixture to make the sauce. Pour the rest of the sauce into a resealable plastic bag. Place the cubed chicken into the bag with the marinade. Toss to coat evenly then seal the bag, removing as much air as possible. Place bag in fridge and allow chicken to marinate 4-24 hours. Once the chicken has marinated, prepare a grill to medium-high heat. While the grill is preheating make the sauce. Place the reserved marinade mixture into a small saucepan with 1/2 cup water. Whisk thoroughly. Place pan over medium-high heat. Bring to a boil. Meanwhile, dissolve 1 tbsp of corn starch in 1 tbsp cold water to make a slurry. Once the sauce is boil, slowly drizzle in the cornstarch slurry while whisking continuously. Allow the sauce to continue to simmer for another 60 second, stirring constantly, until thicken slightly. Remove from heat. Remove the chicken from the marinade and place directly onto the preheated grill. Grill over medium-high heat approximately 3-4 minutes per side until the chicken is just cooked through. Serve chicken and bourbon sauce over white rice. Enjoy! The best part about this dish IMO was the rich bourbon-y flavor of the sauce. I want my bourbon chicken to taste like bourbon dammit, and this did. PS – I thougth the fact that you could actually taste the bourbon (but not in an overpowering way) was what made this dish great too! So, do you have any leftover bourbon so that I can make this without actually having to go out and buy any? And if you do have any left over…why don’t we use up some of those lemons and have some whiskey sours one night?? We do! And we would love to share it with you! I’ll bring it tomorrow. Long time reader, first time cooker. I tried this recipe last night along side my standard homemade sweet & sour chicken. It was really good! …although all I had was low sodium so I added salt to get it back to “normal” and made it waaaaaaay too salty. I think the recipe probably would have been perfect for me, had I just left it low sodium. It’s so pungent (in a good way) and my guests loved it, even though they commented on how salty it was too. One mentioned that when mixed with a bite of rice, actually tasted almost perfect. Thanks for the great recipe! I’ll be making this one again. You had at with sweet and spicy. I just love that combination together especially with chicken. I’m inspired to give this a try. Btw I really enjoy the site and the great photos go well with the recipe post as well. Thanks for sharing this recipe!